NORTH STAR - Bodies and rolls are made of cast and carefully machined high-strength special alloy aluminum. Gears are made of the strongest material available for this application, nylon or steel. Bushings are nylon and the remaining parts (except plastic gear covers and knobs) are machined steel. Table frames are 14-gauge steel. Tabletops are of moisture-resistant Medex with a melamine surface. Metal surfaces are zinc plated or coated with a durable powder coat finish. Virtually no maintenance is required, and the simplicity of the design ensures that any repair ever needed will be quick and easy. 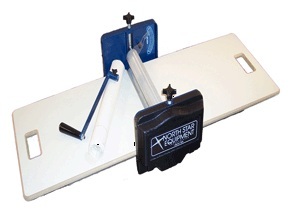 NORTH STAR - Combine the North Star 18" standard slab roller with a specially designed set of table toppers and you have the North Star PortaRoller. 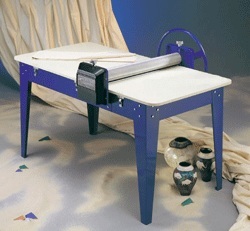 Designed for ceramic arts teachers who are moving from classroom to classroom and for studio potters who need a fully functional slab roller but have limited space. BRENT - Portable and extremely durable, this slab roller is compact enough to fit on a table while rolling out slabs up to 14"w x 15"l. The Mini Src is ideal for taking to workshops or for studios with limited space. It is constructed of steel pipe and bent plate so it will last for many years. 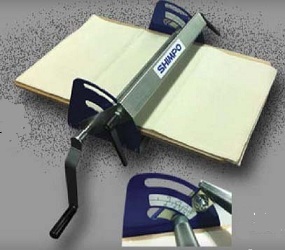 SRM1624 SHIMPO - Shimpo's new mini slab roller features a two-roller system with hand lever and thickness indicator that provide synchronized fine adjustment that can produce a thickness of 0-1". It's lightweight (31 lbs) and compact design make it easily portable; and yet it's 16"x24" table makes it a permanent addition to any studio or classroom.